“Only in returning to me and resting in me will you be saved. In quietness and confidence is your strength. I recently had a short dialogue on a website centering on the subject of David Platt. The dialogue was initiated by an individual stating that Platt’s sermon at the upcoming Together 4 the Gospel will be “Martyrdom and Mission: Why Reformers Died In Their Day, How We Must Live In Ours.” You can bet Platt’s sermon will have a “radical” edginess to it. I wrote about Platt and the “Radical” buzzword back in December 2013. You can find the article here. I also wrote about Platt in August of 2013. The article was titled “Truth in Advertising?” and can be viewed here. I documented the fact that Platt, in an attempt to look radical and sell books, was less than truthful. Platt is a bit too intense for my liking; he seems to always be on message and that message is: Christians must be radical; lose-your-life radical; give-up-all and go to a dangerous foreign country radical. But hey, it sells books and fills conferences, and at the end of the day, the bottom line for American Evangelicalism seems to be all about the bottom line. Platt’s target audience for all things radical appears to be high school and college age youth. These young adults are energetic, idealistic, and desirous of doing great things for Jesus. Lately, it appears Platt is expanding his message to an older group of man-boys, specifically the T4G conference attendees. The T4G conference is like a high school pep-rally on steroids. Billed as a “biennial conference for pastors,” it has morphed into a conference with an all-star line-up of Neo-Calvinist Christian celebrities. Book sales are brisk and if you are fortunate you may be able to snag an autograph or two of the celebrity pastor you most idolize. 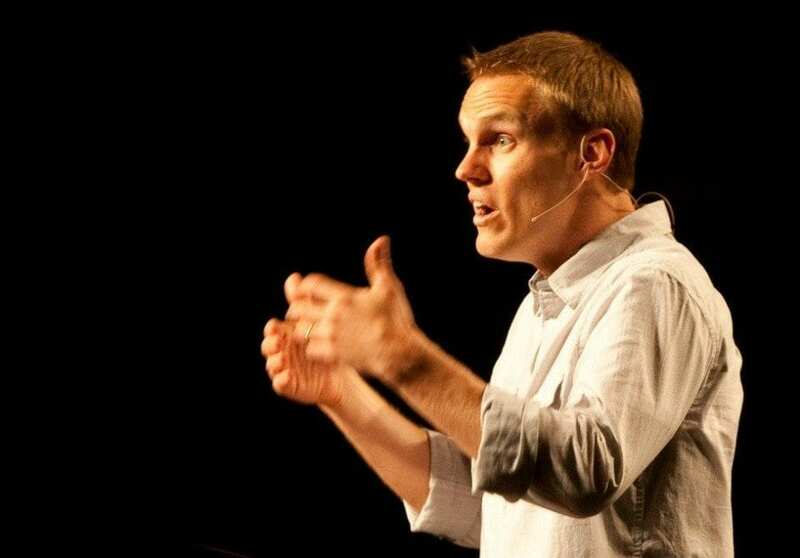 “Radical” David Platt is on message! John Piper, a celebrity seemingly one step below Abraham, will also be in attendance at T4G, sharing his wisdom and discernment with his adoring fan-boys. Speaking of discernment, you may recall Piper is a vocal supporter of CJ Mahaney (he of blackmail and conspiracy to cover-up sexual abuse fame) and also supported Mark Driscoll (he of plagiarism and possible RICO fame). Anyway, Piper, whose track record on picking winners that are, shall we say, less than stellar, seems to think that Platt’s “Radical” has all the makings of a winner, so now he is hitching his wagon to that horse. The only problem is, the whole “Radical” plea foisted upon younger Christians seems to be causing them a lot of problems. To anyone paying attention this is no surprise; neither is the fact that Piper has picked another loser. 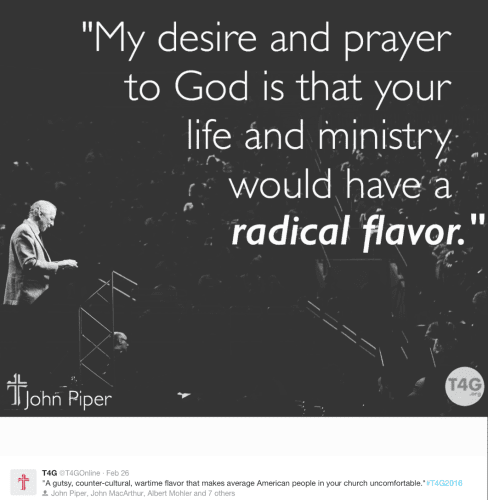 Pastor “Emeritus” John Piper marketing the flavor of the day. This brings me to the subject of this post. In my dialogue, mentioned above, a lady was kind enough to point me to an article about Jonathan Hollingsworth. Hollingsworth is an admirable young man who has a soft heart for the down and out of society. He lived out his faith in Christ by caring for “the least of these.” He gave away his clothes, fed the hungry, gave money to the poor, and befriended the friendless. Hollingsworth was, in my opinion, demonstrating the love of Christ in concrete ways to those among us who are needy. But Hollingsworth always felt he wasn’t doing enough. Fueled by Christian authors such as David Platt, Hollingsworth felt his life could always be more radical for Jesus, and to that end, he decided to go to Africa for one year. What followed could only be described as a disaster, both in Africa and even worse, by his pastor when he returned home. Hollingsworth and his mom wrote an outstanding book about the ordeal and I highly recommend it. Platt is not the only author to “make bank” by appealing to young, eager, idealistic Christians to live a radical, sold out life for the Savior. Unfortunately, when Christians sniff a buck is to be had, there is no shortage of individuals who will attempt to capitalize on the opportunity. 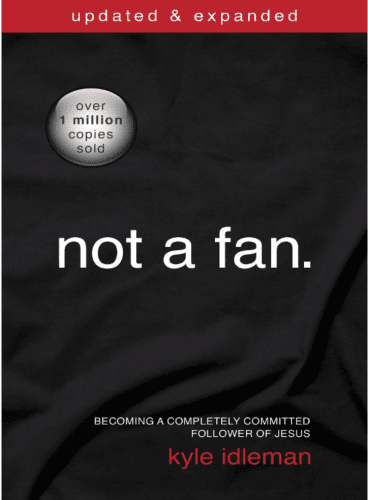 Below I illustrate Platt’s book and a similar book titled “Not a Fan” by Kyle Idleman, two of the most successful sellers on this subject. I am certain that if you search you could find several other similar books. These next three videos are, in my opinion, tailored to young people. I find them quite disturbing. Jonathan Hollingsworth’s story is full of sad stories, stories of men more concerned with money and reputations than people. Saddest of all was Hollingsworth’s pastor. He did his best to shut Hollingsworth and his parents up. Unfortunately, we see this type of behavior over and over among pastors dealing with sexual abuse in their church. The Wartburg Watch has just published one such story recently. Hollingsworth, Amy; Hollingsworth, Jonathan Edward (2015-03-03). Runaway Radical: A Young Man’s Reckless Journey to Save the World (pp. 134-136). Thomas Nelson. Kindle Edition. In my opinion, we Christians would be better off to be a whole lot less radical. Life is a marathon, not a sprint. Take a deep breath or two and break free from the frenetic lifestyle trumpeted by the likes of Platt and Idleman. Take time to enjoy life and love those around you. Matt B. Redmond is a favorite author of mine. He authors a great blog and his book “The God of the Mundane” is a refreshing salve to “Radical.” The man is sensible and normal. Below is a quote from his book. I am all for what Redmond advocates, may his tribe prosper! Where is Kevin DeYoung’s Regard For the Weak? An outstanding post, Todd. Your words just cut right through this subject. How many people have messed up their lives for this nonsense? Hopefully some may be saved by these books. ‘Come to Me, all who are weary and heavy-laden, and I will give you rest. “Take My yoke upon you and learn from Me, for I am gentle and humble in heart, and you will find rest for your souls. One of the biggest problems the Christian has is they do not really want to WAIT on GOD for direction; and they are not used to exercising faith to wait. They have to do something. Especially new Christians. So before they are able to see clearly what GOD has for them, they ACT. For many going off to missions is one form of this, thinking they are going to do great things for GOD. Isaiah 40: But they that wait upon the LORD shall renew their strength; they shall mount up with wings as eagles; they shall run, and not be weary; and they shall walk, and not faint. This is not just a beautiful Scripture, it has a lot of truth in it for the Christians life span. I’ve seen the legalism aspect of it with the spiritual superiority exhibited by some of those “sold out for Jesus”. I’ve also outlived many of their missionary efforts and know more than a few that crashed and burned. I am suspicious of so much of it due to the mixed motives I’ve seen in myself. I had my “change the world” phase, luckily the responsibilities of a job, wife, and children tempered much of it. Still I dare think there is much pride that fuels it. I recall from decades ago someone putting the great commission in the context of “as you go”, making it part of your normal life. Unfortunately I and many got caught up in the desire to mass produce disciples rather than it being part of the relationships we cultivate in life. My big issue with Platt and other celebrities is they are not servants, any leading should be by example. Their example is anything but radical or sacrificial, unless you define sacrifice as being feted as a celebrity everywhere you go and lucrative book deals. A passage from Matthew has taken on a new significance for me. But Lord didn’t we sign a lucrative book deals in your name? Didn’t we attain the adoration of masses in your name? Didn’t we have a six figure pastor salary in your name? Didn’t we fly first class to celebrity pastors conferences in your name? Be gone from me you evil doers. This is EXACTLY what I thought when John Piper published “Risk is Right” a couple of years ago. All the fan-boy five star reviews are unbelieveable. Notice the “forward” in Piper’s book by David Platt. “Risk Is Right” is a reprinting of a chapter from “Don’t Waste Your Life”. It had nothing new that Piper hadn’t already said. It would seem the powers that be all got together and said, “Hey, this David Platt has made bank on the “Radical” theme. How can we get on board?” (Enter Crossway publishing) “I know, let’s reprint some of Piper’s stuff and repackage it to mirror Platt’s book.” Bazinga!!!! For Piper to preach “risk” to others is laughable – he who retired from a mega church and moved to the quiet southern town of Knoxville, TN to work on his writing. And let’s not forget that was after he took a 7 months sabbatical for self reflection and to work on “the precious garden of his home” as he put it. Seriously, who gets to indulge in that level of navel gazing? Only celebrity pastors. Joe-pew-sitter can’t afford to drop out of life for that sort of nonsense. Thanks for the comment, M. Joy. I also find it strange when Pastors who have never done anything but give talks in air-conditioned lecture halls run around telling young people that it’s their job to endure the hardships of bringing the Great Commission to the developing world. And it’s not just overseas missions either. When was the last time you saw any of the T4G guys volunteer at a homeless shelter or do anything besides promote their books and conferences? Hey Buddy!, I found this information for you: "Radical or Mundane?". Here is the website link: https://thouarttheman.org/2016/03/04/9marx-increases-its-presence-in-the-united-arab-emirates/. Thank you.